“Floods are one of many factors that keep massive amounts of the population in poverty and always on the brink of disaster,” said Eric Viala at the second event in a four-part series on water security organized by the Wilson Center in cooperation with the Sustainable Water Partnership, which Viala directs. 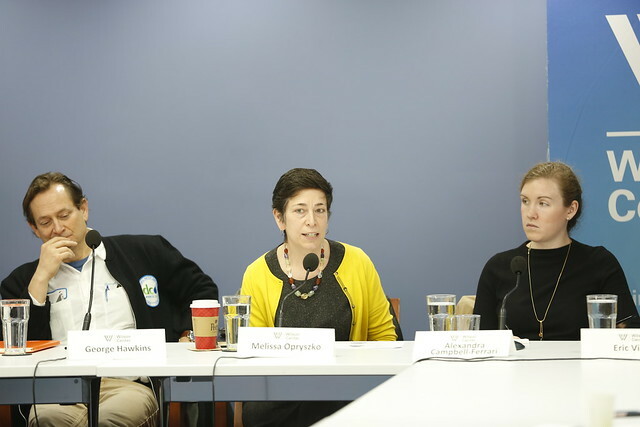 Panelists at the event discussed the impact of intense flooding on vulnerable communities and proposed innovative and collaborative approaches to reducing their risks in the face of disasters. Extreme flooding events can generate considerable amounts of damage, particularly in densely populated, low-income communities, compromising both lives and livelihoods. Floods cause traumatic injuries and death by drowning, as well as elevate the risks of cholera, malaria, dengue, and chikungunya, said Melissa Opryszko, senior WASH advisor for USAID’s Office of Foreign Disaster Assistance. In addition to these immediate dangers, floods destroy businesses, agricultural lands, livestock, and basic services, leading to “a complete disruption of systems,” she said. The Office of Foreign Disaster Assistance seeks to save lives, but also to reduce the disruptive impacts of disasters on social 63and economic systems by “getting those systems up and running again,” said Opryszko, but “it takes time.” Long-term recovery is a difficult, drawn-out process that requires close collaboration with development partners; but a long-term perspective is essential for sustaining livelihoods in vulnerable locations, she said. High rates of poverty and population growth drive people to move into areas that are prone to flooding and erosion, said Viala. In Bangladesh, two million people live on sandbars that appear after monsoons and then disappear when the rivers rise again. Moreover, changing rainfall patterns are making floods much harder to predict in certain areas. Although many countries, like Bangladesh and Cambodia, are used to dealing with recurring floods, “what they don’t know how to deal with is climate change,” he said. “In most instances, it’s a combination of methods that will be required,” said Anita van Breda, senior director of the Environment and Disaster Management program at the World Wildlife Fund (WWF). In an effort to help communities around the world prepare for floods, WWF has developed a green guide to flood management, which details disaster risk management methods and encourages the use of nature-based solutions, like wetland reconstruction, soil conservation, and the restoration of natural drainage pathways. Reflexivity is also critical because “if we’re not learning, we’re not practicing adaptation,” said van Breda. The good news is that communities in the United States and abroad are beginning to focus on a flood management approach “that requires a certain amount of flexibility and adaptation as part of that process,” she said. As CEO and general manager of the DC Water and Sewer Authority, George Hawkins has extensive experience responding to and preparing for floods in the urban United States. Hawkins has managed multi-million dollar green infrastructure projects designed to capture storm water in Washington, D.C., using sandbags and other nature-based methods. But when millions of gallons of water are flowing, green infrastructure alone can’t contain it. Extreme events require huge public works projects, and “the costs are extraordinary,” he said. Although it often seems that infrastructure is the main problem, the reality is that “this is a governance issue,” said Alexandra Campbell-Ferrari, the executive director of the Center for Water Security and Cooperation. For both prevention of and recovery from flood damage, a legal view can help us understand the rules and regulations that affect our exposure to risks and our available solutions. We need to ask “what is the purpose of the rules that we’re setting?” said Campbell-Ferrari. How can stakeholders balance their concerns “as both people living in these communities but also taxpayers?” Cambell-Ferrari asked. “What are we willing to pay for putting more restrictive rules in place? Versus what are we willing to pay after the fact, if we allow greater freedom of choice upfront?” With the recent string of devastating natural disasters causing massive floods around the world, “now is the perfect time to ask these questions,” she said. Photo Credit: A house in Bangladesh surrounded by flood waters, September 2009, courtesy of the UK Department for International Development.